How am I ever going to get through the holidays? How will you ever finish that to do list? Not to mention, how are we ever going to solve our homelessness crisis and bring equity to our schools? And we haven't even started talking about climate change. What can embracing mystery teach us about facing overwhelm? December has arrived and we have begun to explore this month's theme of Mystery. For those who haven't heard me share about this in a meeting yet, the monthly themes we are working with come from Soul Matters, a collaborative network of about 200 UU congregations. Soul Matters began at the congregation I served in Rochester, New York, focused on small group ministry. In addition to inspirational materials that help me and the worship associates craft meaningful worship services that flow week to week, Soul Matters provides rich packets of resources for small groups to go deeper with the theme each month. Those who have participated in these small groups, which meet monthly and are very similar to the Chalice Circles that have been held here, have raved about the quality of intimacy and connection as well as the spiritual depth that the groups provide. New small groups, which we'll call Soul Matters groups, will be forming in January to begin meeting in February. If you'd like to be trained to facilitate a group, let me know and plan to come to a training January 9th, 7-9pm. If you'd like to participate in a group, fill out one of the neon yellow forms at the greeter table this month and put it in Dianne Estrada's box in the community room. Each monthly theme packet for Soul Matters groups begins with a reflection on the theme. I hope Soul Matters piques your curiosity and you might consider being part of this exciting way of engaging within our congregation and with other UUs across the continent. Again it was wonderful to have so many friendly helping hands Deck the Halls last Sunday. The fresh scent of pine with wreaths being made. The luscious flavors of homemade clam chowder and vegan soup with fresh baguettes to dip and munch, and the happy sounds of people enjoying each other's company while in service to the community. This project truly is a community-wide effort and a lovely tradition. The list of helpers is too long to print here, but I do want to lift up Judy Finn who stayed until the final dish was clean, the last counter was wiped, and the compost had been taken out. Chanukkah Week - We had a little lesson with the youth last week which we will continue this coming Sunday with latkes for all the classes and some dreidel games. 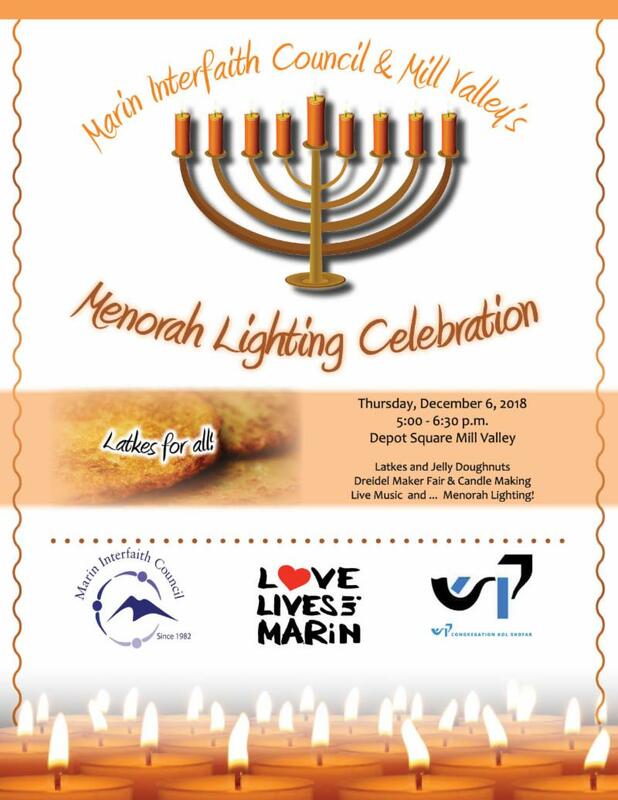 Please check out these Chanukkah resources and share some with your family: DIY Menorah Ideas (I am particularly fond of easy #6 with the citrus) Hanukkah Blessings & If you want to do a fun interfaith support for our Jewish siblings check out this event flyer: Marin Interfaith Public Menorah. Fair Trade Chocolate Sales Return to UUCM - This YUMMY youth group project is back and new arrivals will be in this Sunday. You might want to buy some of these slave-trade-free yummies for stocking stuffers or just have a guilt-free treat for yourself. Toiletries for the homeless and fire victims - Please bring in your collections of travel toiletries. We will be packaging them up on Jan. 6th. Youth Families and UU Young Adult Annual Solstice Ritual - Led by the Meluch Family on Saturday, Dec 22 we will gather at 7pm in the Fireside Room to make wish candles for the coming year. [Out with the old and in with the new.] We will share in a circle after calling the directions. Upon releasing the circle there is food and frolic with music. We aim to finish by 10 pm. All YRUU families are encouraged. YRUU graduates are very welcome. SO many thanks to the people who have provided us with color and beauty all through the fall. Now is the time to fill the winter slots: Jan, Feb and March. Some of our "regulars" have volunteered already, but we need many more. It would be wonderful to welcome a flower arrangement from a newcomer - or an old timer who's never waded in before! It's easy and fun - Winter arrangements are, by definition, quite spare, reflecting a beautiful shape or texture. OR, if you want color, Trader Joe's or Safeway await with bunches of flowers for less than $10. Please email sallyrschroeder@comcast.net with a date of your choice. Add a second date in case your first choice is already taken. Many thanks, and happy holidays to all! We have had a very successful program of 3 small "Chalice Circles," with groups meeting each month during 2018. The current groups will have their final meeting in December. We are pleased and excited to rename this program "Soul Matters Groups," and in 2019 we will be using the monthly Soul Matters themes. Now is the time to kick-off new groups for 2019. Soul Matters Groups allow members and friends to join a group of 6-10 people, lead by trained facilitators, who meet once a month. There are monthly themes and a structured format that create a space for sharing the things in life that are really important to us, and deepen our connections with each other. The new groups will have their first meeting in February 2019, and continue with monthly meetings until December 2019. We recommend that people participating in this program commit to going to each monthly meeting, and make a one-year commitment. You do not need to be a UUCM member to join a group. It is easy to sign up for a 2019 group! Option 1) Fill out the "yellow form" that is in the lobby and turn it in to Dianne Estrada or another facilitator listed on the form, or 2) Send an email to dianneestrada11@gmail.com indicating your interest and availability. That's it! The deadline to express your interest is January 15, 2019. Join us for an evening of relaxation and camaraderie. Children and adults get acquainted over board games, cards, Scrabble, Pictionary, Boggle, Trivial Pursuit, chess, and more. You are welcome to bring snacks to share. Members and nonmembers of all ages are welcome. The Unitarians of Alaska are pleased to announce that the 2019 WhaleCoast Alaska tour information is now posted on their beautiful new website https://whalecoastak.org. 12/6 Truth Act Forum with the Board of Supervisors - this meeting will give the community an opportunity to confront the County Sheriff on his providing names to ICE of undocumented individuals as they are released from custody. This action is in violation with SB 54. A rally will be held at 4pm on the grassy area bordering with North San Pedro Rd across from the Civic Center PO. The meeting with the Board of Supervisors occurs at 5:30 in their offices on the 3rd floor. Please attend! As a Sanctuary Congregation, it is critical that we show our support for the undocumented community. All UUCM members and friends are invited to the Transylvanian Holiday Tea with Balázs Scholar Lehel Molnár and family Saturday, December 8, 2:30pm at Starr King School 2441 Le Conte Avenue, Berkeley . A voluntary donation to the Balázs Scholars Program helps support this program. Make your check to Starr King, write "Balázs" on notation line, send to Starr King School, 2441 Le Conte Avenue, Berkeley, CA 94709 or donate online (specify Balázs). Saturday, December 8, 2018 from 9:45 to 11:45 AM:UU Writing Class: Terry Lucas, acclaimed poet, will lead this session. He is a gifted freelance poetry coach. More about Terry and his work can be found at www.terrylucas.com. He loves all genres of writing and will provide writing prompts. Please bring to the session as many previously written pieces that you are either working on, or that you are willing to work on. If you have no previous work, that's okay too, as there will be time to create new work in the session. Note changed start time from 10 am. SAVE THE DATE! Sunday Dec. 9 @ 12:15 in Fellowship Hall. What exactly is MOC anyway? UUCM is now a member of the Marin Organizing Committee (MOC). Come to learn the history of MOC and how it is working for justice issues like homelessness, affordable housing, tenants' protections and educational equity right here in our backyard. Join Social Justice committee members and Rev. Marcus along with a variety of MOC members from other Marin congregations. Everyone is invited!! We are looking for two volunteers to coordinate the refreshments after the 7 o'clock service on December 24th. This would entail setting up the room, setting out plates of sweets brought by the congregation, making punch and taking down the room afterwards. We would use paper cups for the beverage so no dishwashing would be necessary. Please contact Marge Hollinger or Judy Finn if you are willing to volunteer for this important event. Attached at the link below for your information is the latest Facilities list of pending projects. They are categorized roughly as high, medium, and low priority, but otherwise they are not prioritized. We have tried to reflect the feedback that we received at the last Congregational Meeting. We will be discussing these each month at our regular meetings, and making decisions regarding which projects to move forward based on available funds. Your feedback is always welcome.